Hey everyone! Hope all of you had a wonderful weekend. 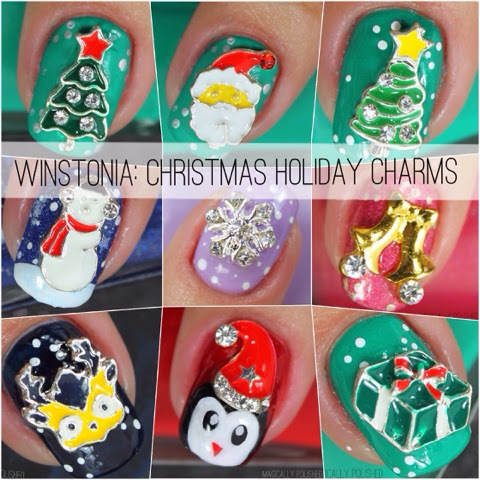 Staring the week with my Part 2 Holiday nail charm set from Winstonia Store. 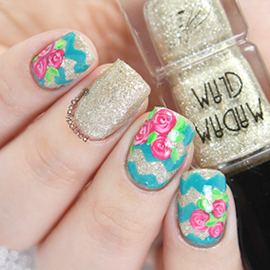 A an amazing nail art store with tons of nail art supplies and decorations. They are now even selling indie nail polishes and cuticle oils from Love, Angelie and Sweet Baby. The Holiday set I have for review consist of 12 different fun holiday pieces. Each are completely different and a great variety to choose from. So lets get to it: The first one I have is the Santa Hat charm. Isn't it just adorable?! I love this charm! I knew the perfect design to create with this design, a penguin of course! I haven't done an animal design since last year, so I took the time to do one again. For the look I used Kiko 238 Martha Red and Essie No Place Like Chrome. For the charm, since it is a one day wear I applied top coat, and placed the charm on top of the penguin. Now for my favorite (of course) Santa charm! This is soo cute! I decided to recycle my snowflake mani, and placed the charm on the ring finger. I even added a few dots around the charm, and applied Essie Matte Top Coat for a matte finish. Instead of creating a new design with this Christmas charm! I even added a few dots around the charm, and applied Essie Matte Top Coat for a matte finish. For the next charms in the set is a stocking, another Christmas Tree and green present. For the look, I used Kiko Denim 463 Evasion Lawn Green and created some present designs using Born Pretty Store Christmas themed water decals. For the charm, I applied top coat, although you can use nail glue or gel for long lasting wear. Here's another look using the same design and different charm (the green present). Here's another recycled look using the same design and different charm (the Christmas tree with yellow star). Here's another favorite of mine the snowman charm. Absolute adorable! I had the perfect look I wanted to do with this charm. I used The Little Lacquer Bean Spooky Night, a gorgeous holo glitter polish perfect for this design. I added a few dots/snowflakes with a acrylic paint and snow fall. I then placed the snowman charm over top coat.